At Big Sister Mouse, our school in the countryside near Luang Prabang, everyone from first-graders to young adults looks forward to the visitors who help them English. We have many ways to make that enjoyable for everybody, including games, and conversations about "What's life like in your country?" 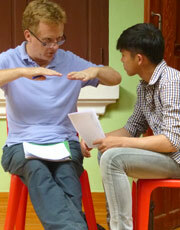 If you're visiting Luang Prabang, please join us for a day at Big Sister Mouse. You'll have fun while also helping both young adults and smaller children with their education. More about Volunteering. We're having a party! A book party! Then we'll leave more books for daily reading. 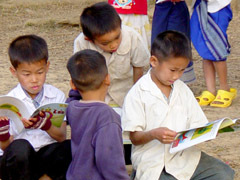 When we started Big Brother Mouse in 2006, most children in Laos had never seen a book, other than a textbook – and textbooks don't make literacy fun. There was no system for getting books into rural villages, some of which involve a day or two of travel from the nearest road. That's why Big Brother Mouse invented book parties. Here's what we do at a typical half-day party. The parties are run by our staff. Usually four young people go to the village. If things have to be carried, it may take five or six. This party, at Ban Naa, involved three hours on the road, an hour by boat, and 90 minutes of hiking. 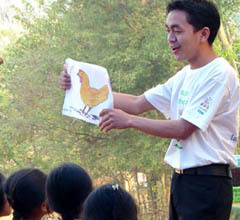 Staff members are typically age 16 to 22, and come from similar villages, so they quickly connect with the children. First, we talk about books. Khamla is too busy running Big Brother Mouse to be at most events, but he went to the first book parties, then trained others. Here he discusses the Frog, Alligator, Buffalo, the alphabet book he wrote. Later today, students will each pick a letter, write a humorous sentence about something starting with that letter, then draw a picture. For many, it will be the first creative writing they've ever done. Tha Thao was 16 when he won our first art contest, and since then he's illustrated five books for Big Brother Mouse. Here, he gives a simple art lesson. For older students, we have a different lesson, showing examples of how to create expressions on characters. Then there's some drawing time, which is always popular. Everyone loves to draw, but rural children often do not even have pencils. Afterward, they get to keep the pencil and a few sheets of paper. Outdoor games provide a change-of-pace at each book party. Sonesulilat, who plans these, wrote our book Game Time, describing both traditional games and new games he has invented. In the game show, a team of three has to pick up a cardboard tube, using some strings that they must manipulate together, then race back to the finish. Sonesulilat also wrote a song about books, which he and Sipoubon teach, and which is sung with great relish. Sonesulilat, who was just 17 years old when this photo was taken, is one of the young people whose innate creativity, energy, intelligence, and goodwill have had a chance to flourish at Big Brother Mouse. Literacy is officially defined as the ability to read; but for literacy to be meaningful, books and reading need to be incorporated into daily life. Your first grade teacher probably read stories aloud to the class. Later, perhaps a teacher read a chapter a day after lunch, from a longer book. 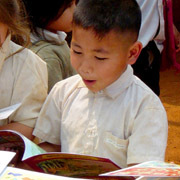 We're encouraging that custom here in Laos, although first, of course, the teachers need books that can be read. Our booklet The Joy of Reading provides advice for them about how to make reading-aloud a fun event for all concerned. Choosing your first book is a big decision! We briefly describe the books we've brought, then each child can choose a book that they will own. This becomes an object of real pride, and when we've revisited villages months later, many children are carrying their book with them. 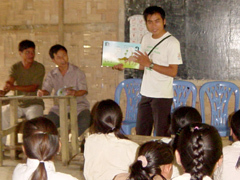 When we started in 2006, we provided books to schools free. The Lao economy has grown greatly since then, particularly in the Luang Prabang region, and after twelve years, we decided that continuing to do so, while it did bring short-run benefits, also created a damaging sense of dependency in which villages waited for someone to come give them something. We now ask villages to co-pay a significant portion of the cost of the book party and reading program. The result is that we go to fewer villages, but those we reach are committed to improving education. Much of our attention now goes to our Big Sister Mouse school, where we are developing effective alternatives to rote education, as well as ways to train teachers in these methods.